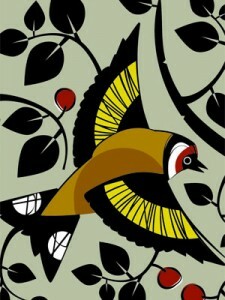 What with Ghosts of Gone Birds in Brighton and an exhibition at Pelham House in Lewes it’s been a good start to 2013. 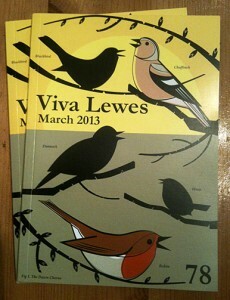 In addition I’ve also worked with Viva Lewes to design the cover for their 78th issue. Although winter still has its icy grip here in the UK it’s heartening that, along with the coming of light, spring is just around the corner. 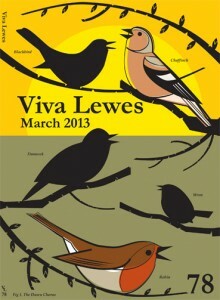 To help us keep this in mind I suggested that a cover based on the dawn chorus would be a good thing to do and luckily Viva Lewes agreed!! So what’s behind the design? Well as I’m a big of the Collins New Naturalist series I wanted to do something that both gave a nod to their splendid covers and also act as a reference that readers could use. I envisaged that people would be able to pick up a copy then maybe go for a walk and use it to help to identify some of the birds that they seen singing in their gardens or around town. The cover is also accompanied by a lovely bit of writing by Sussex Wildlife’s Michael Blencowe (it’s on page 79 of you have a copy!) 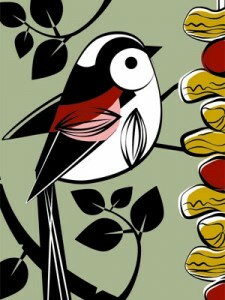 and includes my illustration of the Blackbird song. 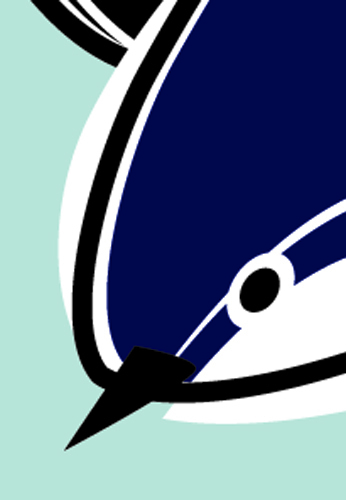 Both myself and Michael have also put together an interactive map at http://t.co/mrQNrgU8 where you can report different birdsong as you hear it. We’re looking for lots of input so next time when you go for a wander why not listen out for natures’ free stream and let us know which birds you hear! Michael has also put together this rather neat guide of some of the birds that will be singing ’round your way. Take a look here to see pics & hear the songs!